German players and spectators were shocked when the US tennis association played Germany's Nazi-era national anthem before first-round matches at the Federation Cup tournament on Saturday. The United States Tennis Association has been forced to apologize after performing Germany's Nazi-era national anthem at a Federation Cup tennis match on Saturday. 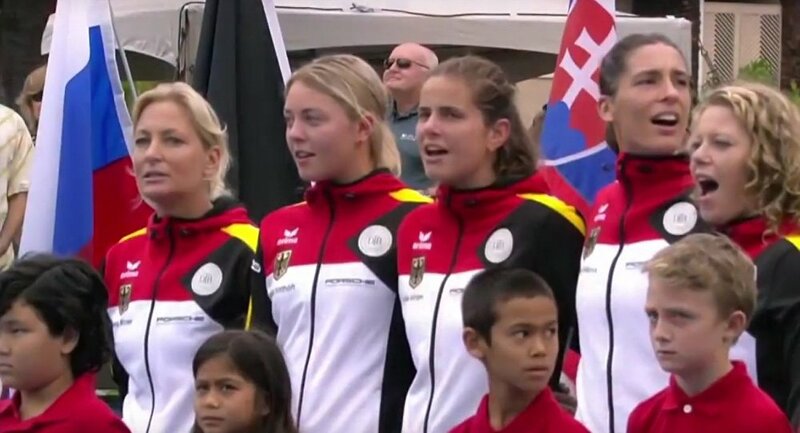 "The USTA extends its sincerest apologies to the German Fed Cup team and all of its fans for the performance of an outdated national anthem prior to today's Fed Cup competition," the USTA said in a statement. "In no way did we mean any disrespect. This mistake will not occur again, and the correct anthem will be performed for the remainder of this first-round tie." ​Saturday's match in Hawaii was a first-round tie between Germany and the US. As the German team lined up before the match to sing the national anthem, they were shocked to hear the first stanza of the Deutschlandlied. It is considered overtly nationalist and begins with the words, "Deutschland, Deutschland uber alles" (Germany, Germany above all). German players and spectators were shocked when the wrong anthem was played. The Deutschlandlied was written by poet August Heinrich Hoffmann in 1941, and first became the German national anthem in 1922. The song was associated with Nazi Germany, and it was banned by the allies after World War Two, along with other Nazi symbols. The third verse, which begins with the words, "Einigkeit und Recht und Freiheit" (Unity and Justice and Freedom) was reinstated as the national anthem of West Germany in 1952. When opera singer Will Kimball began singing the song's first verse, German tennis players and the audiences were visibly shocked and attempted to sing the third verse over him, without success. German player Andrea Petkovic told a press conference following the game that at first, she wondered if the incident was a "hidden camera" stunt, and considered walking off the court as the song began. "I've played Fed Cup for 13 years now and it is the worst thing that has ever happened to me," Petkovic said following her 7-6 (10-8) 6-2 defeat by Alison Riske. In the other match, Coco Vandeweghe of the US beat Germany's Julia Goerges 6-3, 6-0. "Jule Goerges immediately began shouting when she heard the singer's first words, and I also was angry and had tears in my eyes. The bad thing is that this falls back on us and not the Americans," Petkovic said. The German team's captain Barbara Rittner said the incident had "deeply affected" the team. "This is a scandal and inexcusable, it's very disrespectful. I could have cried, because in the Fed Cup it is always a sacred moment, a goosebumps moment, to hear the anthem," she said. The incident is not the first time a host country made a mistake with a national anthem at a sporting event. At shooting championships in Kuwait in 2012, the Kazakh team was stunned after the organizers played a song from the film Borat, instead of the real Kazakh national anthem, when gold medalist Maria Dmitrienko received her medal.